While the Altador Cup was over for a few days, the Altador Cup prize shop now has opened. So has the Staff Tournament prize shop. Now you can spend your points on Yooyuball items, Team Caps and Staffmember Bobbleheads! Some older prizes, including the Water Yooyu, have been re-released as well. Our guides for both prize shops will be updated soon. To keep things Altador related, the Altador map has gotten a nifty make-over. It seems the map is now HTML5, so you should be able to see it on mobile devices as well. The Altador Cup Has Ended! The Altador Cup Committee is doing the last of its tabulations before announcing this year's results. Depending on whether a tie breaker is needed, the tournament's final outcome should be revealed in news for July 3rd or 4th, so be sure to check back then! Reminder that July 2nd the Atlador Cup NC portion will end. Head on over to Legends of Altador to claim your prizes and purchase any last minute tickets. And check out our Legends of Altador Guide to learn about all the awesome prizes each ticket offers! Also don't forget about the Altador Cup Grams, they have a date for next year, but it's most likely a mistake and will also retire soon! Check out our Grams Guide for more information on the two Altador Cup Grams and other previous grams. Lastly, don't forget to get your team gear from the NC Mall before July 3rd, it won't be made available again until next Altador Cup! The results for round 2 of TNT's staff tournament are in! Our guide has been updated to reflect the new scores, check it out! Don't forget to finalize your picks for round 3 after you pick up your nps! I'm a kiko that's also... a cat. The first two weeks of our SunnyNeo Staff Tournament are in! It was a battle to find each teams placing among the three teams. Team Mysterious Shines' Wolf and Faith together had an amazing force on the Yooyuball field, giving this team the first place in the game. However, Team Darigan Weewoos had a great team effort across the side games claiming first place in them all together. Padfoot and David teamed up to take Slushie Slinger and Make Some Noise where Padfoot and Vanity concured Shoothout Showdown together. Their group effort puts Team Darigan Weewoos at the top of Round One. So it was a battle for second place. Unfortunately for Team Double Trouble, Team Mysterious Shines had effort from all three members on Slushie Slinger and Make Some Noise, where Team Double Trouble's only hope was Vicki who couldn't compete against the three. Corine managed to put up some impressive numbers for Shootout Showdown giving Team Double Trouble second place for this side game. And so the lines were drawn. Week two brought about some changes to the field. Unfortunately David and Brooke were unable to play and so the Bench Reserve was called upon. Jocinto filled in for David on Team Darigan Weewoos and Sebrina filled in for Brooke on Team Mysterious Shines. Once again, Wolf and Faith teamed up and dominated the Yooyuball field laying claim once again to the game's first place slot. With Sebrina's help, Team Mysterious Shines took over all three side games as well! The three worked well together and gave amazing effort across all four games giving them this weeks win. Even with Jocinto's great efforts in YooyuBall, the team Darigan Weewoos fell short on the yooyuball field and couldn't combat with Team Double Trouble's Corine and Vicki. However, once again Vicki had to hold her own on the two side games Slushie Slinger and Make Some Noise, causing the team to fall short once again. Although, the three pulled together and put up great tallies for Shootout Showdown and laid claim over Darigan Weewoos there. And so the two teams tied for second place this week. Also, a reminder our AC Customisation Spotlight is still here. So please, enter your pets. The two categories are Player In The Off-Season and No-Team, Team Spirit! 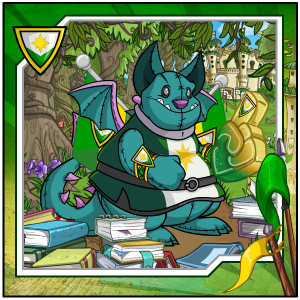 If you have a pet that is just like one of the players on one of the teams (ie: a Green Gelert like Lyvon on Altador, or a Magma Kougra like Aldric on Moltara), dress your pet to show what these players do in the Off-Season - when the games are no longer going on. Do they like to read, visit a beach, or perhaps go shopping? For No-Team, Team Spirit! we were looking for brand new looks for teams that do not have a team. Show us how your pet shows their spirit for their home or favored town by dressing them so. 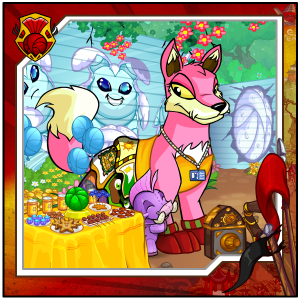 Do you have a rainbow pet that hails from Neopia Central, or perhaps a lutari who would love to show their spirit for their home town? Enter today! Dyeworks is back with an all new set of items, if you've been dying to dye your bowties and bows, well TNT heard you! Check out our Dyeworks Guide for all info of the new items! Previews coming soon! Our Legends of Altador Guide has also been updated! Stay tuned for monday when TNT releases the next set! The first round of the TNT Staff Tournament results are in! Check out how you did! We will be updating our guide shortly! Edit: The Staff Tournament Guide is now live! How did your favorite staff members do in round one? SunnyNeo Staff Tournament - Enter Team Double Trouble AND Introducing Bench Reserve!! Terribly sorry for the delay, our own Altador Cup goals sometimes get in our way. But alas! Here we are and our third team has arrived for our SunnyNeo Staff Tournament! Let me introduce to you Team Double Trouble. This Team has big shoes to fill claiming to be twice the team. This team kicks off with our longest veteran still going in our tournament, Corine who supports Meridell. She's done so much for SunnyNeo in the forms of Customisation and Guides that we're sure she's put something on our site that you've found very handy and helpful. She's known for constantly obtaining All-Star status and is sure to be at the core of this team. Up next, we have Mikey supporting Lost Desert, who is responsible for some of our many game guides. Mikey has been on our Staff Tournament for some time now as well and having huge success on Team Super Heroes in previous years. He's been All-Star in the past, but fell short last year. His game-play is nothing but something to watch out for as he may just suprise the competition how much he can accomplish this year. Or will he have a repeat of last year and run short on time to play the Altador Cup? Then we have Vicki who is our resident Battledome Expert and Shenkuu Supporter. Where Vicki may lack in quantity, she spreads her gameplay across the field. She does not strictly dedicate to one game or the other, nor does she exclude any games from play. If there is a team that all doesn't like a certain game, Vicki may be this teams edge to claiming victory over them. With this team long-time supporters of their AC teams, can they together hold strong to their team here on SunnyNeo and bring in the victory? And the cast Color Spray and stun the enemy! Introducing a brand new thing this year - we have a Bench Reserve. Basically, this bench is holding a couple players that in an event a team has a player that does not participate in ANY game that week, one of the benched players will step in and their scores will be counted in their place. Now this will be random so one bench player may not always be on the same team to fill in. They may get moved around - luck of the draw. We have three teams of three, with two benched players. In the event that all three teams have one member not participating, then the bench players will not be called in. However, if one or two teams have a player miss a week, the bench players will step in. In this year, Sebrina will be first to call in. She's our second Lost Desert supporter here and is newer to SunnyNeo. She has been doing a few updates to the Packrat and Usuki lists as she has time. She was happy to participate this year, but unfortunately to keep teams even, it didn't balance in her favor. However, we came up with this awesome idea to make sure she got the full SunnyNeo experience. Jocinto is supporting Tyrannia this year, and recently retired from SunnyNeo from our Customisation. He's done so much more around the site keeping things updated, responding to neomails and more! We miss him being around more. However, he's always willing to help us out when we call, and was willing to participate to allow Sebrina to play. Unfortunately we didn't find a third teammate for them to make a full team, but now Jocinto is helping by filling in if needed by a team on the bench. The two of them will qualify for the trophies at the end as well. We hope this wasn't too confusing to understand. May be easier to explain if it comes into play. Put me in, coach. I'm ready to play, today! After all those new team avatars, today 9 (!) new stamp avatars have also been released. As always you can gain these after completing the corresponding page of your Stamp Album. You can use our Stamp Album List to check which stamps you still need. Also, with the Altador Cup being up and running, so if the NC Challenge part of the AC. This year, visit the homesteads of the Legends of Altador. First of, is Kellard, the Thief, and it should be no surprise his place to go is a Den of Thieves. Our NC Challenge guide has now been updated. Update: If you hadn't received it after reaching rank 1, check your preferences again. Many users report it showing up there now! The games have begun! Head on over to the Colosseum to represent your team! Avatar Note: There are reports that the Altador Cup Player avatar is not being awarded to those that reach Rank 1, it is currently unknown whether that is a glitch, the requirements have changed or if it has been retired. We will let you know as soon as we have more information. Update: The Altador Cup Player avatar is now being awarded again. With all the Altador Cup excitement, don't forget that a new round of skirmish is about to start. Visit the Battleground of the Obelisk until the end of Wednesday to choose your faction. Competing in this round will be the Thieves Guild, the Order of the Red Erism and the Seekers. As everyone awaits the turn of day to charge forward with their gameplay in the much anticipated Altador Cup XIII, another SunnyNeo Staff Tournament Team enters the Colosseum. Enter Team Mysterious Shines! This team is ready to take on anything with Wolf leading them on, supporting Haunted Woods. Wolf is our daily updater who handles our Daily Puzzle and Crossword, Top Games Ratio, along with teaming up with Juji, the scorekeeper, on updating event pages such as Daily Dare and so forth. He's been a tough competitor for the SunnyNeo staff teams always coming out with an All-Star title by the end of the cup. He will be this teams rock, but can his teammates keep him afloat in this competition? Brooke is newer to SunnyNeo and is a General Page Maintenance and supports Darigan Citadel. Can this newbie be an unknown threat against the other teams? She may be the secret this team needs to pull ahead. Faith, who is a long time supporter of Kiko Lake, also steps into the Colosseum. Faith is apart of our graphics team, and although her time gets limited, her graphics are favored across our site and are seen all over Neopia. What she brings to SunnyNeo is quality that clearly shows when everyone seems to favor what she puts forth. Can she bring the quality this team will need to boost their score total, even with less games played, or will she flourish and rake in a quantity of games to surprise the competition? If you are eagerly awaiting the start of the Altador Cup XIII, we did some Team Interviews that you can read over. We came up with brand new questions this year to shake it up. So we went from standard, "Why do you support this team?" and "What's your favorite side game?" to brand new exiting questions such as, "Which of the Yooyu's that aren't in the game would you like to see added and what would you think their special ability would be?" So give them a read over and see what your fellow teammates think. Does your team not have an interview filled out?? Contact Juji to represent your team in the interview questions (first come, first serve). Quite interesting answers are coming in to these exciting new questions. This year's Altador Cup will start on Monday the 4th, visit the Colosseum to join your team and start practicing your games. The sign-ups will close on June, 6th. So, make sure you will have chosen you team until then! Otherwise you will not be able to participate. Still have trouble deciding which team to play for? Try our Altador Cup quiz for some suggestions! Or just browse our Altador Cup Coverage for inspiration. Almost there now! The excitement is rising! 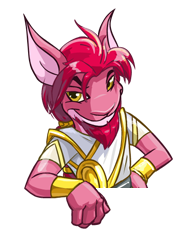 To receive this avatar you need to complete the Neopia Central page of your Stamp Album. Check out our Stamps Album List Guide for all information on these stamps and others. As everyone is on the edge of their seats awaiting news from the Altador Commitee on what is the latest on the Altador Cup, all the standard Altador Cup teams have arrived. And now, the SunnyNeo Staff Teams begin to enter. First to arrive, we have Team Darigan Weewoos! This team is comprised with three of our staffers. 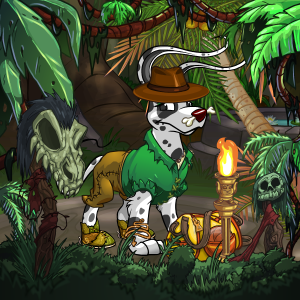 First up, we have Padfoot who is the teams Darigan Citadel supporter. Padfoot is new to our Staff Tournament, but has been around SunnyNeo for a little while now. Normally ,Padfoot does customisation work, but now can she prove her worth in the Colosseum and reach All-Star status for her team? Next, we have Vanity who is a seasoned player on our Staff Tournament - this being her fourth time participating once again supporting Krawk Island. Normally Vanity is doing customisation, graphics, coding and other such things needed around the site, and seems to be the connection between Padfoot and her other teammate. Can Vanity be the rock this team needs and guide them to victory? Thirdly, we have David who is our Programmer here at SunnyNeo. He's been really busy working for us and getting many things fixed and updated. He's been really helping us out here especially as of late and is responsible for some of the great things we have currently and to come. This will be David's second year participating in our Staff Tournament and also supports Krawk Island. Will his additions between work be just that extra push this team will need to take this year's Staff Tournament? Lets hear it for these amazing Staff Members!! Hip, Hip! Hooray!! The new Shenanigifts Glow in the Dark party has been released with several very colourfull items and our Shenanigifts Guide has been updated. We still need several models for these new items, so who don't you go over to our modelling page to see what we still need? On a sadder note, for those of you who have been looking forward to the Altador Cup, it seemd the AC has been postponed for now. The Altador Cup Committee has postponed the sign-ups indefinitely for undisclosed reasons. All attempts to contact the committee members have been fruitless so far. Check back for updates as we try to gather any information we can about the upcoming tournament. Since the AC press pre-event has already finished and all the AC team appeared to have been ready for the Cup, we hope they will not be forced to wait for a very long time before they can start playing. We will keep you updated on this matter. For now, if you want to get in the AC spirit again, have a look at our coverage of the previous years. More Teams Arrive At The Colosseum For Altador Cup XIII! && AC Customisation Spotlight NOW OPEN! More teams have arrived at the Colosseum for this years Altador Cup XIII: Haunted Woods, Krawk Island, Lost Desert, Meridell, Mystery Island, and Roo Island. Has your team just arrived? Also, our AC Customisation Spotlight is now open! You can submit your customisations for the new categories, Player In The Off Season and No-Team, Team Spirit! We hope these new categories are fun, exciting and result in some new and unique looks! Kayn look-a-like studying back home, and a Qasala explorer. More Teams Arrive At The Colosseum For Altador Cup XIII! More teams have arrived at the Colosseum for this years Altador Cup XIII: Altador, Faerieland, and Tyrannia. Will one of these three bring home the Cup?! Altador Cup - Let The Countdown Begin! Three teams have arrived at the Colosseum for this years Altador Cup XIII: Kiko Lake, Maraqua, and Moltara. We are having our SunnyNeo Staff Tournament return as well. The Scorekeeper for our Staff Tournament has entered the Colosseum! And the crowd goes wild!! *waves frantically to her fellow Altadorians* "Go Altador!!" We will also bring back our Customisation Spotlight with two brand new categories. We will once again have a winner for NP Only and NC Included per team, per category. Stay tuned for the entry form to open soon! Last year's Shenkuu NP Only At The Colosseum category winner. The Altador Cup has been confirmed for this year in the Editorial. So be sure to get ready to support your favorite team!! We've started working on our pages and we've actually released our Team Interviews from last year, Altador Cup XII. If you'd like to be featured this year in our interview for your team, please feel free to Neomail Me. We've already started updating our pages in anticipation as well as can confirm our Customisation Spotlight will return with brand new categories! So be ready to brainstorm some new and exciting looks for this upcoming Altador Cup. We'll see you at the Colosseum! If there is anything new you'd like to see from us this year for the Altador Cup, please feel free to reach out to us! Whether its new graphics, fonts, or some other guide relating to the Altador Cup, we're open ears. Also, a quick reminder, don't forget to claim any remaining prize points you may have for the Altador Cup XII Prize Shop or the AC XII Staff Tournament Prize Shop that you may have remaining. Claim your prizes before its too late!